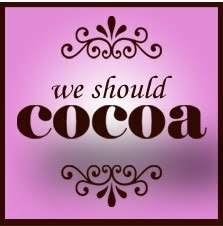 Many thanks to everyone who joined in the We Should Cocoa challenge this month. It’s quite a responsibility to host this well-established challenge and I wanted to do justice to it. Any anxiety I had at the beginning of the month has long gone, as the trickle of entries turned into a regular flow with a few last minute minnies coming in at the last gasp! 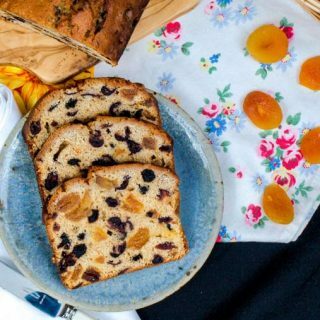 First up is Lapin D’Or and More with this Paul Hollywood inspired Chocolate and Cherry Loaf made with dried sour cherries. 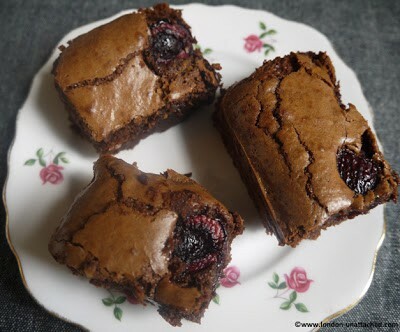 Susie at Fold in the Flour is a bit of a brownie addict and has been experimenting with The Ultimate Brownie Recipe to create these Dark and Delicious Cherry Brownies. 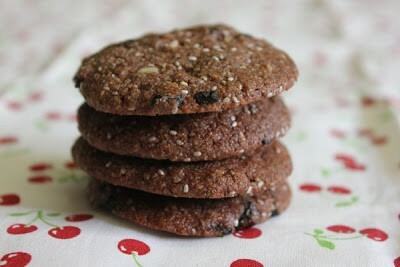 Johanna at Green Gourmet Giraffe went to great lengths to make her Chocolate Cherry Cookies , sourcing the dried cherries at a local middle eastern store and then finding they had stones in them and having to remove them late at night as she made her cookies. That’s dedication for you! 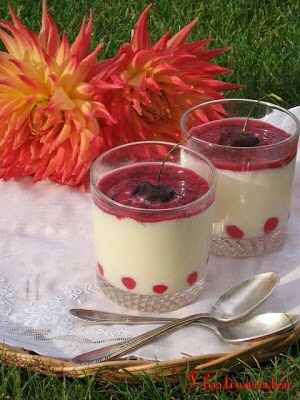 Quite possibly the prettiest entry for the We Should Cocoa challenge this month, is White Chocolate and Cherry Mousse which comes from Kit at i-Lost in Austen. Kit accompanies her gorgeous creamy dessert with a quote from Jane Austen’s Persuasion. 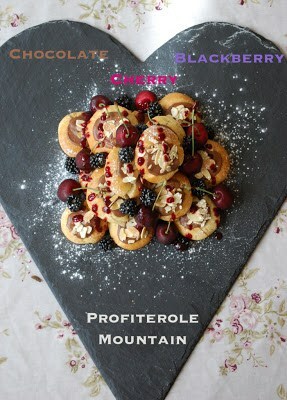 Personally, I think that dessert is worthy of a picnic at Box Hill! Do you like Biscotti? If so you are going to love these Triple Chocolate Cherry Biscotti from The Spice Garden, apparently, they are truly orgasmic! You can’t ask for more than that, can you? 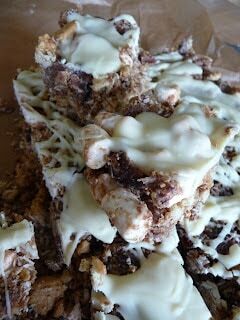 When Tiffin met Rocky Road at Lancashire Food, Cherry Choccy Rocky Road was born! 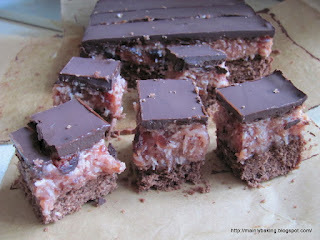 Linzi has created a melange of all things chocolately and sugary and come up with a real winner. 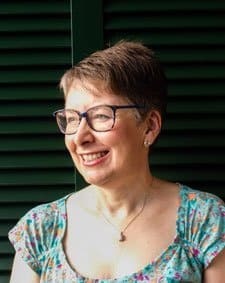 Anyone who is a regular reader of my blog knows that I am a big fan of instant trifles and Sian at Fishfingers for Tea is obviously of the same mind! She has created a Black Forest Trifle, using the classic combination of chocolate cake, cherries and cream and it looks like a winner. 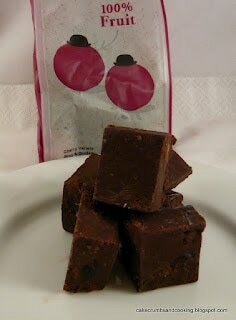 I’m sure Caroline at Cake, Crumbs and Cooking is trying to confuse me with her recipe Nigella’s Chocolate Pistachio Fudge which contains no Pistachios but cherries instead! 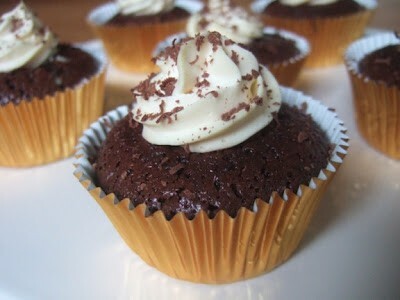 It’s a quick and easy sweet treat. 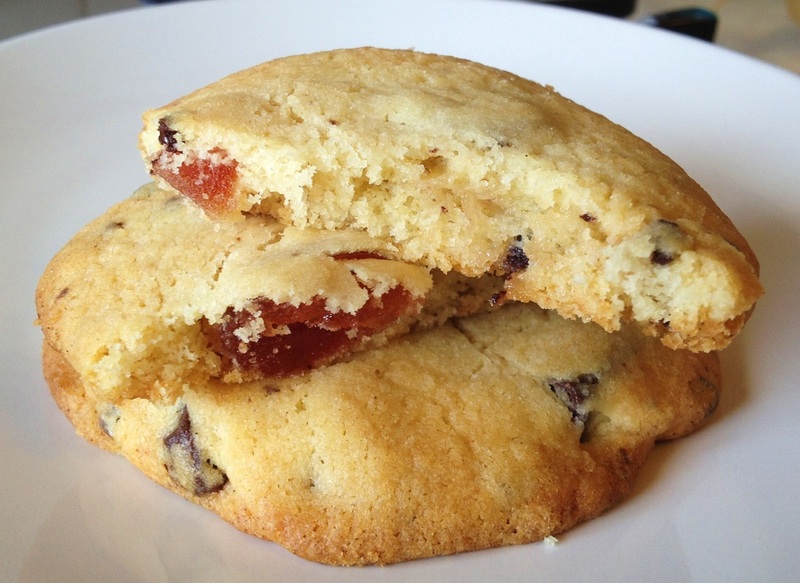 Ros, the More than Occasional Baker has had these cookies on her ‘bake list’ for ages. 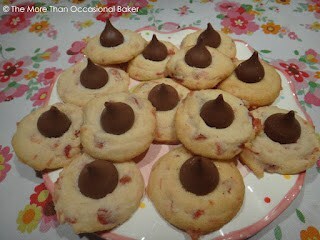 She brought back some Hershey’s Kisses from a holiday in America just to make them! Cherry Chocolate Thumbprint Cookies are sure to be a hit combining almonds, cherries and chocolate in a bite sized morsel. More cookies, this time from Kate at Turquoise Lemons. Kate chose to make Cherry and Dark Chocolate Cookies using chopped dark chocolate and glace cherries. 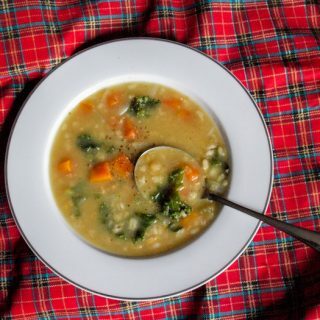 A simple but effective recipe which could easily be adapted to carry other ingredients. 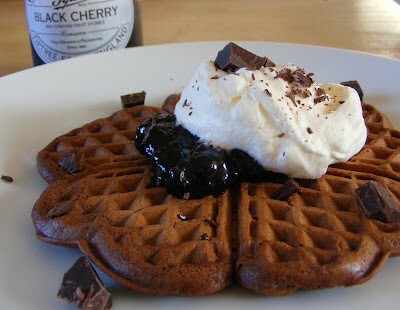 This is a really pretty dessert created by Elizabeth at Tango Like Raindrop: Black Forest Waffles. It was a special treat for ‘Wednesday Pudding Night’ and went down a storm with Elizabeth’s family. 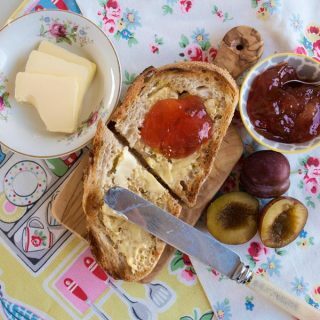 A childhood favourite now with Australian Crunchies from Karen at Lavender and Lovage, perfect for a lunch box treat. I feel a little bit responsible for Dom, of Belleau Kitchen, not achieiving 1st prize in the Aby Village Show with his Deep Filled Cherry Pie with chocolate shortcrust lattice top, could it be that he was placed third because of the chocolate pastry? 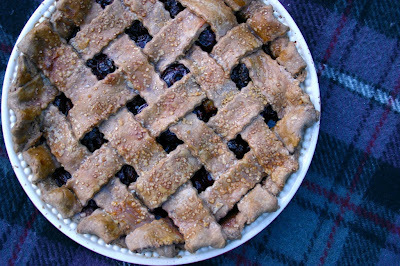 Whatever, it’s done and dusted now and I think that pie looks fabulous and he was robbed! 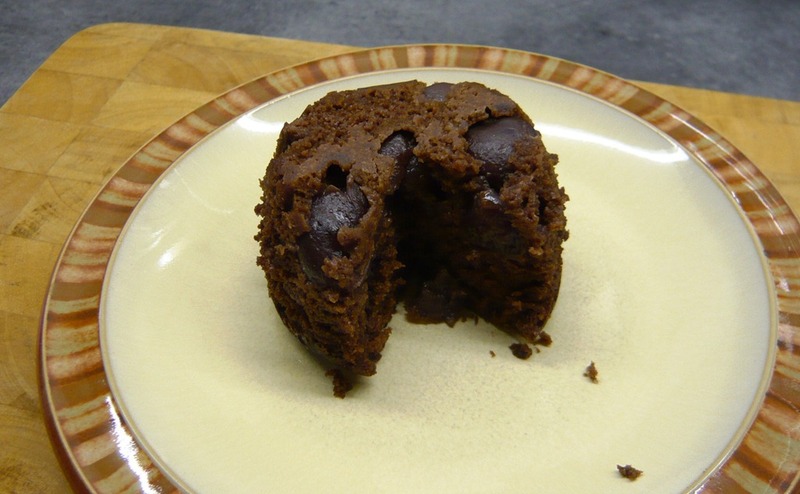 This little Chocolate and Cherry Pudding was cooked in a Slow Cooker! Baking in Franglais discovered it while looking for a slow cooker recipe and was so taken with the idea that different pudding combinations are already planned. 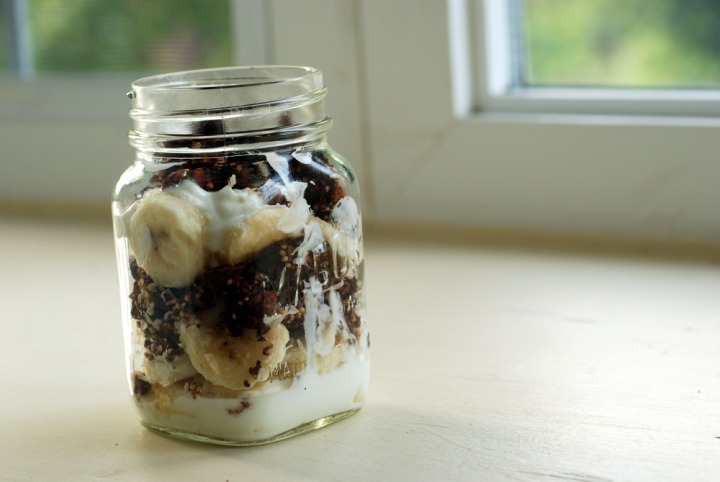 Janet, from The Taste Space, is spot on when she says that everything looks better in a Mason Jar! This Chocolate Cherry Granola Parfait with Banana certainly looks good presented like this. Using a Richard Bertinet recipe, these Chocolate Cherry Tarts from Under the Blue Gum Tree combine juicy cherries, gooey chocolate and nutty almonds into tarts of crumbly, crisp perfection. 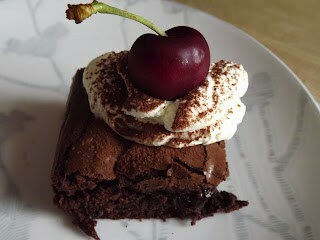 Hannah took us on a beautiful trip down memory lane with her Kentish Cherry Fondant Cake at the Corner Cottage Bakery. 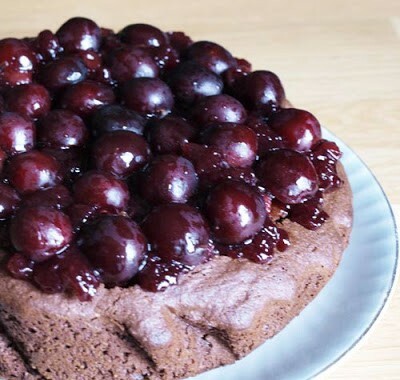 Chocolate Rum and Cherry Cheesecake is the entry from Cake of the Week. This indulgent dessert is actually made with a sugar substitute so a bit more healthy than you would think! 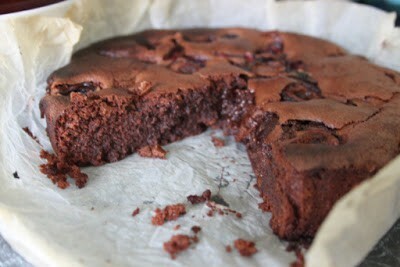 Choclette of the Chocolate Log Blog, Queen of all things chocolately, and co-owner of the We Should Cocoa challenge brings us a traditional cherry dessert from the Limousin region of Francewith a chocolately twist: Chocolate Swirled Clafoutis. 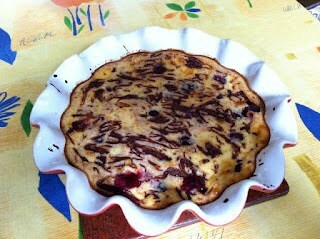 It also gave Choclette a chance to show off her lovely red clafoutis dish. My own entry was a Chocolate Cherry Cake and very tasty it was too! 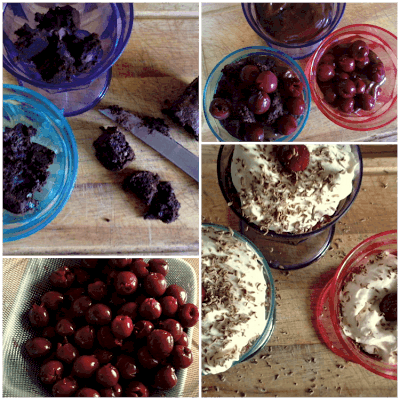 Hungry Hinny had planned a Black Forest Gateau but in the end made these cute little Cherry Chocolate Brownie Cupcakes with a cherry surpries hidden inside. These cakes were destined for a friend who is gluten intolerant so with a little extra thought from the Hungry Hinny, no one had to miss out on a treat. 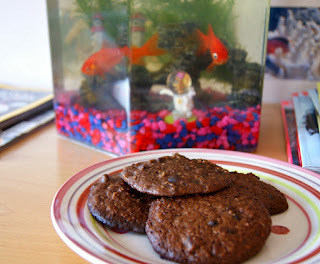 Now for some Chocolate and Cherry cookies from Sharky Oven Gloves. 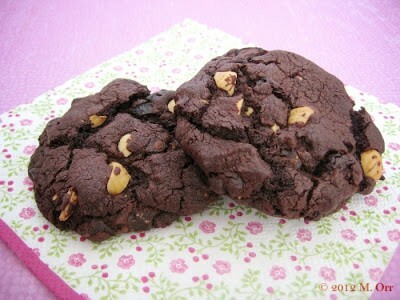 I love the big chunks of chocolate, hazelnut and dried cherries in these cookies. Homemade by Fleur really excelled herself with this stunning Chocolate, Cherry and Blackberry Profiterole Mountain inspired by her holiday in France. 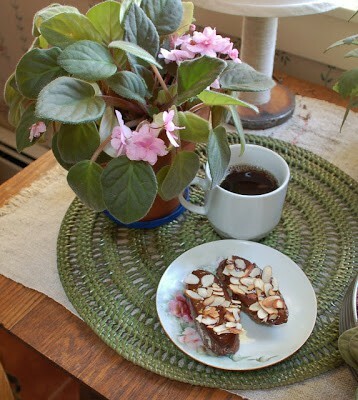 These little Cherry Ripe Bars submitted by Mainly Baking come from a Dan Lepard recipe and are inspired by an Australian confection of the same name. 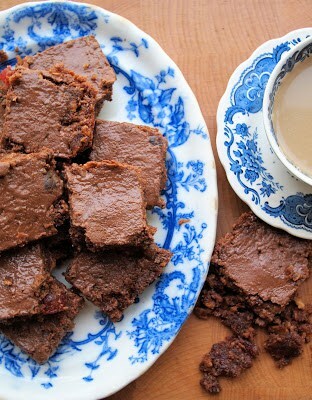 Chewy, sticky and very rich, but totally delicious in small quantities. 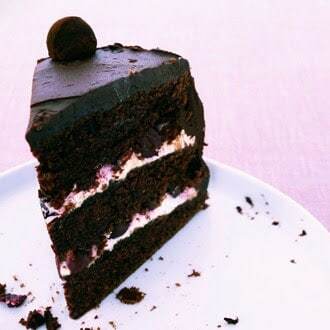 A slice of rich Cherry Chocolate Cake from Cookbooks Galore who describes it as “a Black Forest Gateau without the topping”. It doesn’t look like there is much left anyway! Congratulations to Anne at Anne’s Kitchen on passing her English and Maths GCSEs. 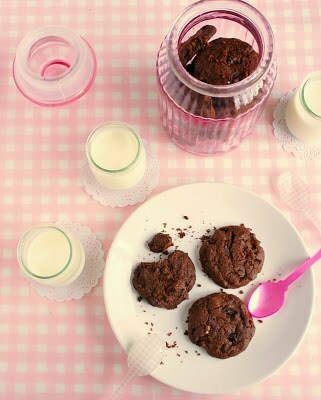 Anne celebrated with Cherry, Cranberry and Chocolate Oaty Cookies another big success. 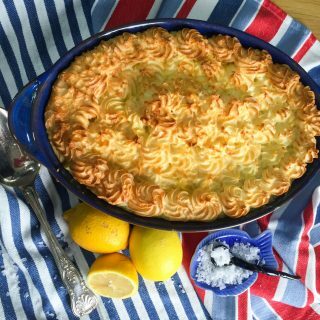 Thank you so much to everyone who took part, I hope I haven’t missed anyone, these were all the recipes on the Linky. 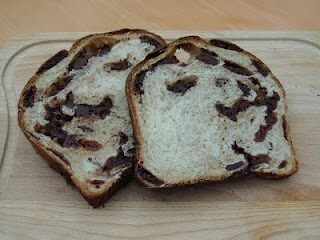 Remember to check The Chocolate Log Blog on 1st September for the new challenge ingredient. Chocolate and Cherry Cake from Lucy at the Kitchen Maid. Excellent round up! 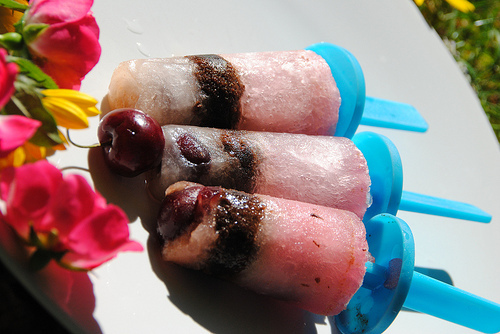 Didn't know chocolate and cherries could be so versatile! Oh no, I forgot to add mine to the linky! Am I too late? Can you add it from twitter? Lots of lovely entries, ESP that cherry ripe one. Be still my beating heart! 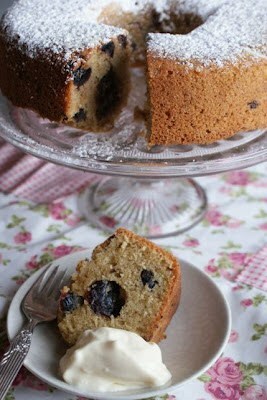 What a great roundup Janice and lovely lovely baking ideas here for me. I was sad to miss out this month just got too hectic! Gorgeous round up! Well done everyone! What a fabulous round up, and so many different ways of combining chocolate and cherries – I'll be bookmarking some of these. Oh my. Dangerous. I have chocolate and cherry cravings now which is slightly strange for 5am on a Sunday morning. 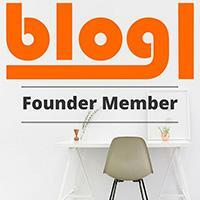 Fantastic round up and a fantastic range of entries, several to be bookmarked! 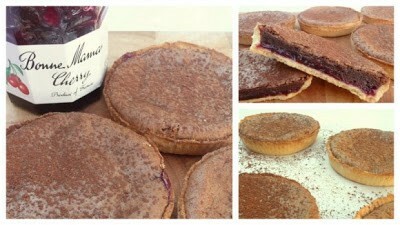 brownies and cookies and tarts! oh my! What an excellent roundup Janice. That has to be one of the best yet!